Express Scripts is the country’s leading independent pharmacy benefits manager with a mission to put medicine within reach of people who need it. This Fortune 25 company practices pharmacy, smarter for 85 million people, making medicine more affordable and accessible. 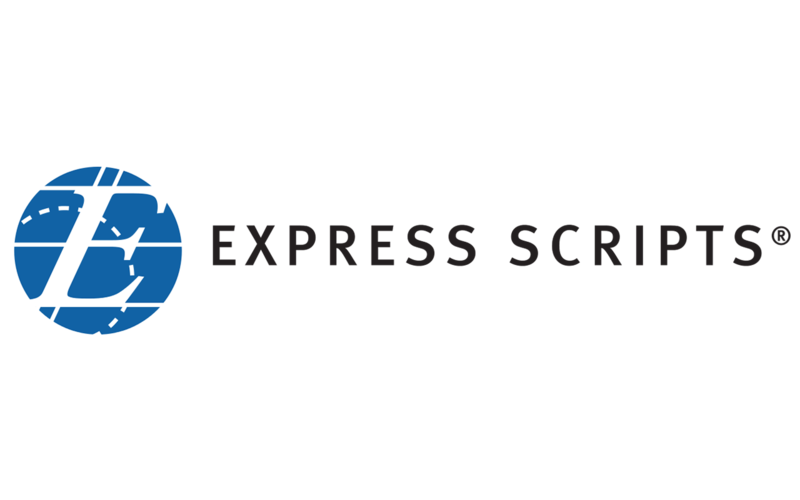 Like many organizations, Express Scripts has many data sources that were historically reported independently. Data related to customer feedback came through website forums, surveys, customer support calls and social media. Logan Meltabarger and the Enterprise Data Science team at Express Scripts set out to build a better process to put insight within reach. They looked to more efficiently combine feedback into actionable analysis, identifying correlations in different words and phrases across these data pockets and build tools to better understand patterns. 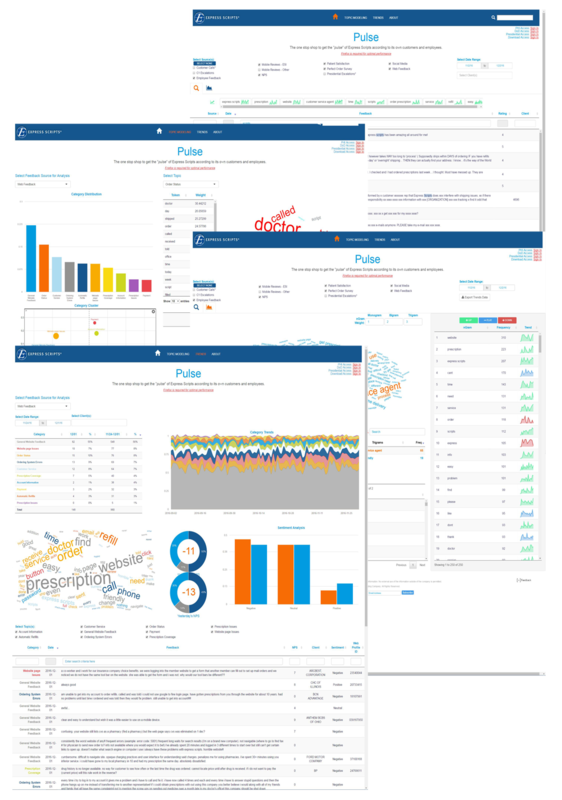 Pulse is an ambitious “smart data” service for Express Scripts executives, managers, sales and teams, which provides a set of interactive Shiny applications to give Express Scripts a more comprehensive picture of the business. Voice of the Customer and Customer Issue Modeling applications leverage a custom ontology, paired with Natural Language Process and machine learning to reveal actionable trends in both words and phrases with frequency, sentiment and correlations. The Drug Trend application leverages Express Scripts’ unmatched research data to give clients drug cost trends, forecasts and opportunities to better manage trend through Express Scripts’ solutions. For client meetings, Pulse is used to create Generated Word Clouds that provide insights into members’ feedback patterns, and a Laser Messaging App analyzes membership data to demonstrate how custom messaging on prescription bottles can improve health and reduce costs. 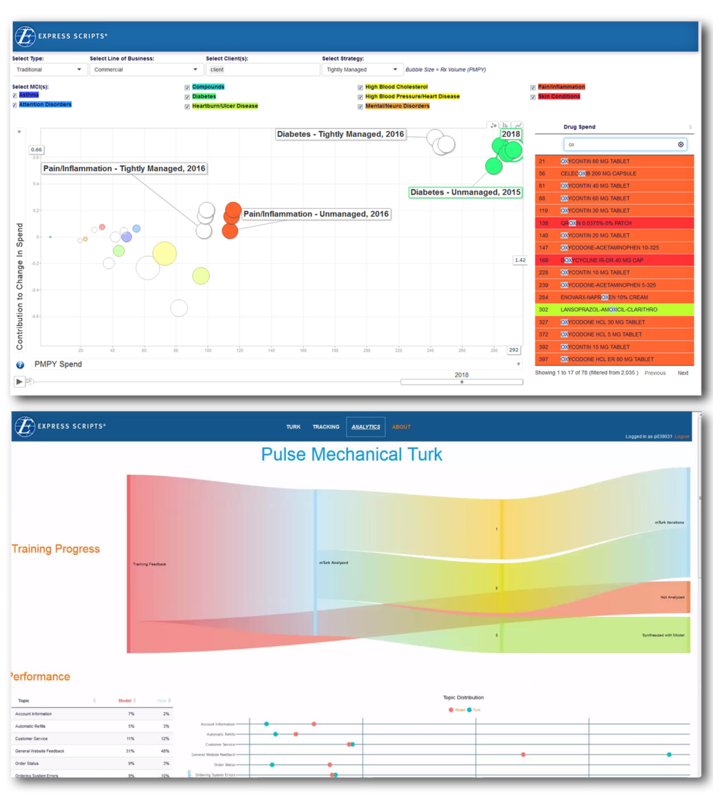 To continuously improve the platform, Pulse has a Mechanical Turk app, which trains the different statistical models with specialist input, and then autonomously updates the models if needed. Healthcare data is sensitive and regulated. RStudio Shiny Server Pro integrated with Express Scripts existing identity and data security practices and layered authentication features ensure Pulse’s PHI compliance. Shiny Server Pro’s usage reporting and administration features also simplified Pulse’s application server management. Pulse’s “smart data” helped Express Scripts customers lower healthcare costs by identifying drug trends and forecasts, and acting on the data by more focused management strategies. Pulse’s ability to isolate actionable issues which managers can use to improve customer experiences contributed to a 10 point improvement in Express Scripts’ customer Net Promoter Score.